Spokane lags in important infrastructure and cultural activities that put the area at a creative and innovation disadvantage: And innovation is really hard when you are on the trailing edge. Broad deployment of high speed Internet to most homes did not occur until about mid-decade (+ and -), half a decade behind major cities. And look at what’s happening in high speed Internet today – in other cities. Real 4G cellular will arrive in a year or three – after it arrives in the major and some not so major cities (it’s live in Yakima, Tri-Cities, Tacoma, Seattle and up to Bellingham). An Apple Store opened in 2010 and a Trader Joe’s in 2011. Until then, Spokane-residents could not see and learn what makes these retailers tick better than others. TJ’s has twice the profit per square foot of any other grocery store chain. 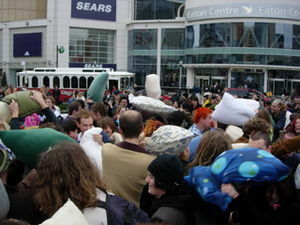 The “flash mob” phenomena started in 2003 and was well along by 2006. Spokane’s first ever “flash mob”, a tiny group of students at Gonzaga, occurred on the GU campus in the fall of 2010 (video link, below). “Improv Everywhere” stages hilarious skits and musical comedy in public spaces, records many of them, and posts them on YouTube. These skits might involve a dozen people or thousands. IE began early in the decade – and as of late 2010, a group is trying to get underway in Spokane. The “lip dub” phenomena began a few years ago. In “lip dubs”, groups of people, often students, lip sync to a popular music song while dancing, walking and wandering around a public space (often a campus). A camera records the action in one long roving take. A church youth group did the first local lip dub in May of 2010; East Vally High School students staged the second in the fall of 2010. These are creative events that arise from creative people in creative communities. If you are familiar with these activities, the following links provide some hints! Honk Fest is a gathering of funky brass bands. Really funky. And percussionists too. And woodwinds. Dozens of bands come to Seattle from around North America to perform on the streets of Seattle. Spokane has its 48 hour film festival – very creative!!! The 48 hour film festival arrived in Spokane in 2006; the 48 hour film concept began elsewhere at least as early as 2001. Spokane has professional arts too – like the Spokane Symphony. But that is normally status quo art and not leading edge art. We also have Bloomsday and Hoopfest and Lilac Festival and so on – all great and fun events but today they are tradition and mostly status quo – not enough rule breaking! Infrastructure and creative culture in Spokane are too often on the wrong side of the curve making the innovation economy that GreaterSpokane and many of us want sort of tough to come by [See footnote]. You cannot be years behind and be a competitive world-class innovator (with some exceptions). Richard Florida says Spokane has a “creative class” (see earlier post for issues with that) – but the reality is infrastructure and contemporary culture are always catching up. It’s really hard to come up with something new and innovative when you are on the backside of the curve. If you do not understand what that means and why that is important … I do not know what else to say. Spotting leading edge problems that translate into business opportunities is hard when you are on the trailing edge and seeing old problems. Recently I observed a problem/opportunity in a local, large business and thought of a solution to solve the problem. After a bit of online reading, I found that the solution has already been built – 5 to 7 years ago! – and has been widely adopted in similar businesses on the west side of the state. As best I can tell, none of the local businesses (all large) in this sector in Spokane has adopted this innovative solution. How do we move from the trailing edge to the leading edge? Many people who want to be on the leading edge have drifted away, leaving a community that is happy with the status quo and does not like change. There is research and quotes from influential people in the community, cited on this blog, that support that assertion. And, for example, I am in trouble for daring to ask these questions! Do we want to be on the leading edge? If the answer is no, Spokane will enjoy its growing government and health care services sector and transfer payments. This will provide a comfortable living to many but limits the upside that could be made possible by innovation. The local area will continue to plod along with its chronic poverty problem and low wage rates 20% (or worse) below the rest of the state for those not in government, health care and education. If the answer is yes, then we need to create an environment where creativity is embraced, innovation is sought, and change is something we get excited about. None of our economic strategies address building a creative community. I do not mean “formal arts” – I mean the informal that invites participation and inspires creativity from everyone and creates a forward looking environment that encourages innovation. Rather than yet another economic strategy saying the same thing as they’ve all said, making the same recommendations, and predicting that prosperity is just around the corner – how do we foster creativity, live a life of adventure and get excited by innovation? We can’t compete nationally or globally (except in some niche markets) unless we can create and innovate at the leading edge. Is Spokane up to that? How you answer determines whether Spokane’s economy continues its decades long slide where per capita income continues to fall relative to the growth of incomes elsewhere – or, whether Spokane develops a 21st century innovation-based economy or whether Spokane’s economy becomes increasingly reliant on government as an ever larger share of the economy. Adopt creativity, innovation and economic gardening themes in future economic plans including a “startup weekend” concept adapted for the Spokane market. De-emphasize the marketing focus on low wages and low costs – that’s boasting that our competitive advantage is poverty. The last decade has shown that this is not a sustainable advantage. The 3 largest “clusters” are government, health care and education. The government and education sectors have not shown benefits from “clustering”, perhaps because they are monopolies. Health care, as distinct from health research, is also questionable as most of health care is devoid of price signaling to consumers. None of these are normal markets- clustering could make them more expensive and less efficient. Niche markets – and businesses that have a reason for being here – such as Itron as a spin off of Avista, or historical businesses, or which have family ties – seem to do best. And perhaps end our focus on pouring concrete. Spokane is very capable of innovation and I think there are many people that have creative talents and skills. With five major universities and a number of other colleges and tech schools, you are bound to run into a person that can reason and be an asset to any company. Questions we should ask is if local businesses allow this opportunity and if adopting trends slowly is what may protect the local economy? Sometimes, with a more conservative market, we can expect more stability. I do agree that Spokane is more higher biotech and the sciences. However, we do need to open more areas and make investments in other fields. Most graduates go to Seattle. What do you think about the local business incubators? I think the local incubators, which is mostly SIRTI, have good people who mean well and who try hard. But they are a state agency and they presumably must live within the constraints of the new laws on clustering, which would appear to steer them towards biotech today. We used to have several incubator type agencies or organizations but most were shut down between 2005 and 2008. SIRTI has a certain type of business in mind, notably those with patentable intellectual property. On the surface, that sounds great. On the other hand, I have worked in areas where we found that patents had little value – the pace of change was so rapid that the value of a patent was short lived. And it was often easy and cost effective to design around the limits of someone else’s patent. A related question is – why does the 2nd largest city in the state need a government run sci-tech incubator? While SIRTI recently announced it is now incubating businesses statewide, King County doesn’t have an incubator like this. Why does Spokane need an incubator but Seattle does not? How does innovation and entrepreneurship arise naturally there but needs assistance here? Understanding that issue would be helpful to figuring out how to create a natural innovative ecosystem here. On the issue of local universities, a major distinction between here and there is, I have noted on this blog, the lack of graduate education in the sciences and engineering in Spokane area colleges. The only technical subject graduate degree here is an MS in computer science at EWU. The only science graduate degrees are an MS in Biology at EWU and an M.S. in Exercise Science at WSU-Spokane. That’s it. No graduate degrees in chemistry, physics, or any field of engineering. The expansion of WSU-Spokane will eventually change that – but all will be in the health sciences. Having worked in several metro areas, including Seattle, I do not think we can have the innovative ecosystem we dream about and wish for unless we have the compelling graduate programs, graduate research programs, and the ambitious people who choose to pursue graduate degrees. Today, if you are ambitious and wish to pursue advanced training and become a leader in your science or technology field, you have to leave Spokane. That’s the problem!